The day one's child gets married is the happiest day of any Mom's life. 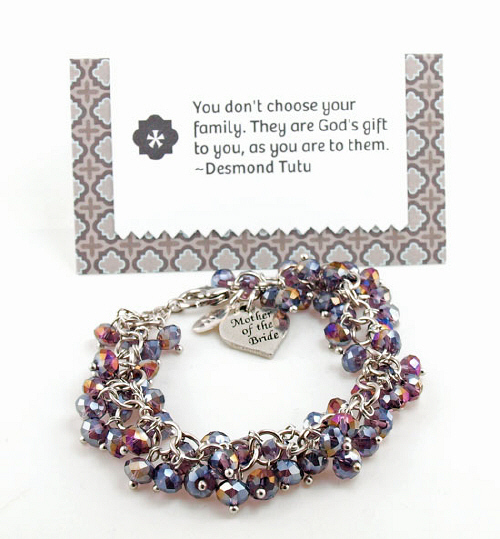 Give her this beautiful personalized bracelet to celebrate the day she sees her beloved daughter or son get married. This will be a day she remembers for the rest of her life, so give her something special to remember it by! This silver-finished steel chain bracelet features 6x5mm purple AB faceted rondelles and a lobster claw closure. It includes on pewter Mother of the Bride Charm or a Mother of the Groom Charm and an additional tag that may be hand stamped with any initial. It comes complete with a folded gift card that reads: “You don’t choose your family. They are God’s gift to you, as you are to them.”~Desmond Tutu. The inside of the card is blank to write your own special message. When folded, the card measures 3.5” x 2”. Free personalization is included. The inside of the card is blank to write your own special message. When folded, the card measures 3.5” x 2”. Additional Details Shop our personalized wedding gifts to find special accessories for anyone who is making your wedding day amazing. From flower girl gifts to bridesmaid gifts, we've got you covered. The Mother of the Bride or Groom would love to receive this beautiful bracelet to wear on your big day.